Even by the standards of the New York Daily News and the New York Post, this seemed like a step too far. The tabloid newspapers chose to put close-up images from a gunman's execution video on their front pages on Thursday, immediately provoking condemnation from other journalists and public figures. Commenters on Twitter called it "disgusting" and "despicable," among other adjectives. Most of the ire was directed at the Daily News, which showed several still frames from the video taken by Vester Flanagan on Wednesday when he shot and killed a television reporter and photojournalist in Virginia. Radio host Mark Levin called the newspaper "heartless" in a tweet. Montel Williams, the former talk show host, said he thought the Daily News was "trying to use shock value to advocate gun control" and urged a boycott. The tabloids have a long history of controversial, even downright offensive covers, which are meant to spur sales at newsstands around the New York metropolitan area. 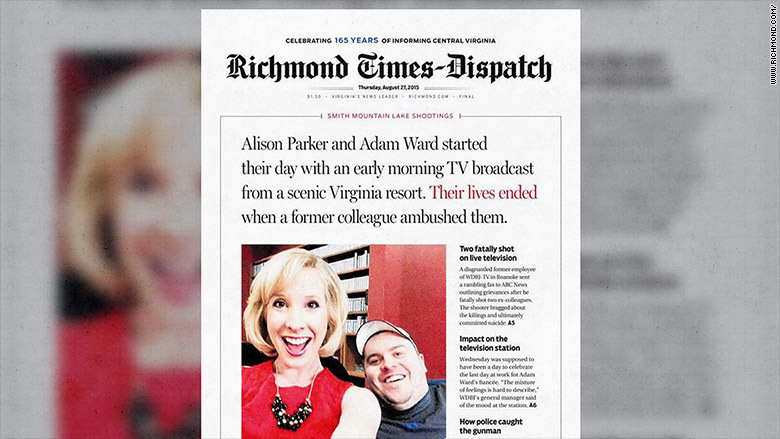 There was a vivid contrast between the New York tabloids and a local paper in Virginia, the Richmond Times-Dispatch, which placed the victims' photos on the front page. News organizations across the country struggled with how to handle the twin videos of the shooting -- the live TV broadcast when the victims were killed, and the video from the perspective of the shooter. Most television networks chose to air parts of the live TV broadcast, but not all of it. The Post and The Daily News were among the web sites that also streamed the shooter's own video. In print, The Post chose one still frame, showing Flanagan holding the gun up to the reporter, Alison Parker, seconds before he fired. Inside The Post, three full pages were devoted to other frames from the video. The Daily News didn't print additional frames any on the inside pages. When the newspaper's cover was posted online Wednesday night, the outcry was deafening. "What have we come to as a society?" asked Dustin Fox, a football player turned broadcaster. Donald Trump advisor Daniel Scavino Jr. tweeted, "Whoever made the disgraceful decision to go with tomorrow's NY Daily News front page - should be terminated. Immediately!" Writer and comedian Lisa Vikingstad said she "tried to fix" the cover by mocking up a version that showed smiling faces of the victims instead of the killer's point of view.